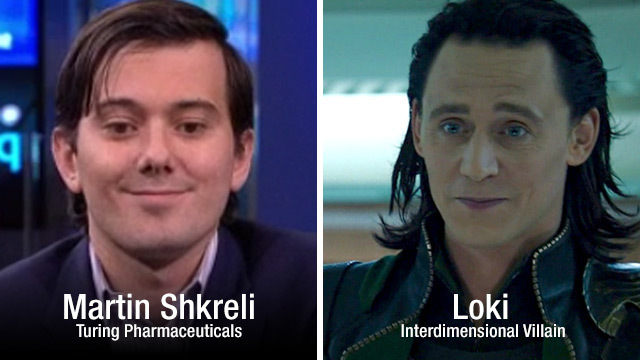 Big Pharma profiteering douchebag Martin Shkreli is actually the evil villain Loki from The Avengers! (NaturalNews) File this under the category of "No friggin' way!" The internationally condemned Big Pharma douchebag named Martin Shkreli -- now infamous for raising the price of what used to be a $1 drug for treating infections to $750 per pill -- looks almost exactly like the evil interdimensional villain Loki from The Avengers! Take a look at this guy's face. I don't know about you, but there's something creepy about this guy that just smacks of a pathological psycho in my opinion... almost like if he weren't hawking hedge funds or selling pharmaceuticals, he'd be running a child kidnapping ring or selling baby parts from Planned Parenthood. Yep, this price-gouging Big Pharma douchebag used to be a hedge fund manager. While taking money from people as a hedge fund manager is easy-peasey, it's even easier to bilk billions out of the masses by running a pharmaceutical company. Just buy up the rights to your favorite drug and then hike the price 5000% or more, all while billing Medicare and Medicaid for the fees. Loki, whom I think is also Thor's stepbrother, sought to enslave humanity using the hypnotic power of his magic staff. One of its powers is the ability to influence human minds and get people to believe false information. In other words, Loki's power mimics the mainstream media and all its pro-pharma propaganda that ridiculously claims all these drug companies are forced to charge outrageous prices so they can "fund more research for more cures." It's all nonsense, of course. The NIH funds most drug company research using taxpayer dollars, and the vast majority of Big Pharma expenditures are spent on marketing, not research. Big Pharma is simply running a profiteering racket while making sure nobody is ever really cured of anything. It's better for repeat business that way. Anyone who thinks the drug companies or vaccine manufacturers actually give a crap about humanity is a fool. Shkreli just demonstrated it for the whole world to see. It's worth noting in all this that Martin "Loki" Shkreli isn't alone. Price gouging and monopolistic profiteering is the entire business model of the pharmaceutical industry. FACT #1: Most Big Pharma funding comes from taxpayers via NIH grants. FACT #2: Most Big Pharma expenditures are spent on marketing, not R&D. FACT #3: Google actively conspires with Big Pharma and the FDA to block pharmacy ads from Canada, where drugs can be purchased at a fraction of the U.S. price. FACT #4: People all over the world pay a fraction of the U.S. price for the exact same pharmaceuticals, often as little as 2% of the U.S. price in places like India. FACT #5: The FDA protects a monopoly of drug prices in the U.S., making sure consumers don't have access to cheaper drugs from Canada or Mexico. People who bring in legal, FDA-approved drugs from Canada are arrested and prosecuted as "drug smugglers." FACT #6: Even while the FDA bans drug purchases from Canada or Mexico, most of the pharmaceuticals sold in U.S. pharmacies are actually manufactured in India or Puerto Rico! FACT #7: Most pharmaceuticals don't treat any diseases in the first place. They treat SYMPTOMS, guaranteeing repeat business by making sure the underlying health condition never gets cured. FACT #8: Most pharmaceuticals cause unintended side effects and organ damage that leads to yet more diseases, requiring yet more pharmaceuticals that generate yet more profits for Big Pharma. FACT #9: Cancer drugs (chemotherapy) cause cancer! And AIDS drugs cause the kind of symptoms that are often diagnosed as AIDS. Many drugs actually cause the very conditions they claim to treat. Some cause other conditions, too, such as antidepressant drugs causing diabetes. FACT #10: The corruption and collusion between the pharmaceutical industry and the U.S. government is extreme. The U.S. medical system is an example of runaway corporate fascism and Big Government oppression. The government oppresses natural medicine, prevention and natural cures while handing a monopoly to the drug industry which claims to "treat" all the health conditions in the country. This is one of the big reasons why America is going broke.